The youngest second lieutenants of the Serbian Armed Forces have been promoted today at the ceremony in front of the National Assembly. A total of 131 male and female cadets of the 139th class of the Military Academy and the 4th class of the Military Medical Academy Medical Faculty received the first officer's ranks. The best ranked ones were presented sabres by President of the Republic of Serbia and Supreme Commander Aleksandar Vučić, while the most successful cadets in their branches and services were presented pistols with inscription by General Ljubiša Diković, Serbian Armed Forces Chief of General Staff. The best cadets of the Military Medical Academy Medical Faculty were awarded parade daggers by Defence Minister Aleksandar Vulin. The best cadets of the 139th class of the Military Academy are Maša Ilić (GPA 9.81, Public Finance study programme), Katarina Janković (GPA 9.69, Management in Defence study programme, Artillery Module) and Dejan Malidža (GPA 9.67, Public Finance study programme). The best ranked in the Army branch is Aleksandar Nuždić (GPA 9,65, Management in Defence study programme, Artillery Module), and the best in the services is Dušan Miljković (GPA 9,60, Military Electronic Engineering study programme, Information Systems Module). The best cadets at the MMA Medical Faculty are Sanja Milutinović (GPA 10.00), Nevena Nikolić (GPA 9.98) and Nikola Trifunović (GPA 9.94). Congratulating the youngest second lieutenants of the Serbian Armed Forces on their first officer's ranks, Serbian President Aleksandar Vučić said that he was standing in front of the youngest generation of second lieutenants of the Serbian Armed Forces with the feeling of honour and pride, in front of those who decided to serve their homeland and to protect the independence and freedom of Serbia with their knowledge, skills and strength of their morale and patriotism. - No task is more important than protecting one’s homeland! You follow the guidelines of our great personalities, who led the Serbian Armed Forces through turbulent historical times with the banner of freedom, not asking how strong the enemy was, because they knew that the enemy’s strength could not be greater than their love for freedom and their Serbian homeland! Who were their minds devoted to when they held their shield firmly and raised their sword high? They are dedicated to us who live today in a free, beloved and respected Serbia, and you, dear cadets, by choosing to become members of the Serbian Armed Forces and taking oath to be worthy and proud successors of your honourable ancestors, have shown that their ideals are alive and eternal, that the spirit of freedom, which was their guide, is here today on this plateau, in your minds and in your hearts – the president said. The Supreme Commander paid tribute to the families of young officers who, as he said, transferred that spirit through upbringing through teachings and through lessons what makes them human persons and what are the values which are worthy living and fighting for. Today these families, parents, brothers and sisters should be proud of them, Vučić said. - During the 168 years of its existence, the Military Academy has been the pillar and fortress of the unshakable and insurmountable defence of Serbia. Many generations of officers were educated in this school. It cherished and transferred the healthy military traditions of our people and perfected talents for the military skills that have glorified us in the world. There is no period in the history of military conflicts in which the superiority of the knowledge, courage and morale of Serbian officers and Serbian soldiers was not demonstrated - from the victory of the insurgents in 1804 to 1813, which enabled the creation of the modern Serbian state, through the Balkan wars and great battles in the First World War, which raised the small, but heroic Serbian nation up to the heights that humanity records in the anthologies of the greatest accomplishments! – the president of the Republic said, adding that unarmed and often immature Serb soldiers have achieved the dictum that glory is something that must be won, and honour must not be lost, because – how will you stand before the ancestors, and what kind of heritage would we take over today. - That is why today we wholeheartedly remember the heroism of our great-grandfathers and those young soldiers who could not manage to leave the offspring, but today their successors, who in the battles on the Salonika front showed that war is not won by force of arms and the army strength, but the motive which you are fighting for, and this people have always fought for freedom and against the conqueror, never reaching for or seeking anything that belongs to others! After all, Franchet d’Espèrey, a great friend of our country and our people, who got to know us during the time of heaviest temptations for our survival, said: “They are peasants, they are Serbs, tough in trouble, sober, modest, unbreakable. They are the free men, proud of their nation and the masters of their fields. But war broke out. For the freedom of their homeland these peasants instantly turned into the most courageous soldiers, the most persistent, the best of all soldiers” the president of the Republic said, adding that each of them has inside them this peasant and the labourer and the soldier, who went to war with 1,300 of his friends to defend his country, he is the officer and the military commander, comrade and the learner from Putnik, Mišić, Stepanović and Bojović, the liberators of this city as well as of that film character of Kursula from the Battle of Cer. - That is why this is a great moment and that is why it is an honour to be with you at this place, President Vučić said and continued - We suffered a lot in the World War II as well as in the conflicts of the 1990s. It is especially true for our people west of the Drina and the Danube. We also lost our demographic capacities, as well as economic strength, and left the country and people who nowadays desperately seek long-term peace and the right to the future. It is you whose power must be a deterring factor for anyone who would like to bring us into conflicts and wars. - It is an important day in your life today and it will be special in your memories. Today you have completed formal education, you are young, you are starting your life. Your future depends only on you, on your further learning, advancement and promotion. It is on us, who lead this country, to make sure that it is free and safe and not to allow your parents to shed a tear that we died in vain. Neither soldiers, nor civilians. The fight we are conducting for Kosovo and Metohija is the fight for justice, the fight for the survival of Serbs at their hearths, and the struggle for lasting peace, so that our descendants would not have to defend their own property in new bloody battles – the president said. He stressed that the years spent at the Military Academy were sufficient and well-used to carry out the professional preparation of new officers. They completed their studies with high average grades and that is why the President congratulated the Defence University, but also stressed that it should be better and better in the years to come. - With a lot of wisdom and perseverance, with a clear vision of the future and, of course, with the sincere commitment of all countries in the region, it is possible to achieve new relations and lasting peace as the highest value. The close cooperation of our country with all the countries in the world gives officers of our armed forces the opportunity to test their strengths, abilities and training levels with colleagues from other countries at a highly professional level. So far, it has been shown that we do not lag behind, but we have much more to master and learn, but others have what to learn from us, as well. The engagement of members of the Serbian Armed Forces in peacekeeping missions is another form of our contribution and an indicator of our commitment to global peace – the commander-in-chief of the Serbian Armed Forces underlined. 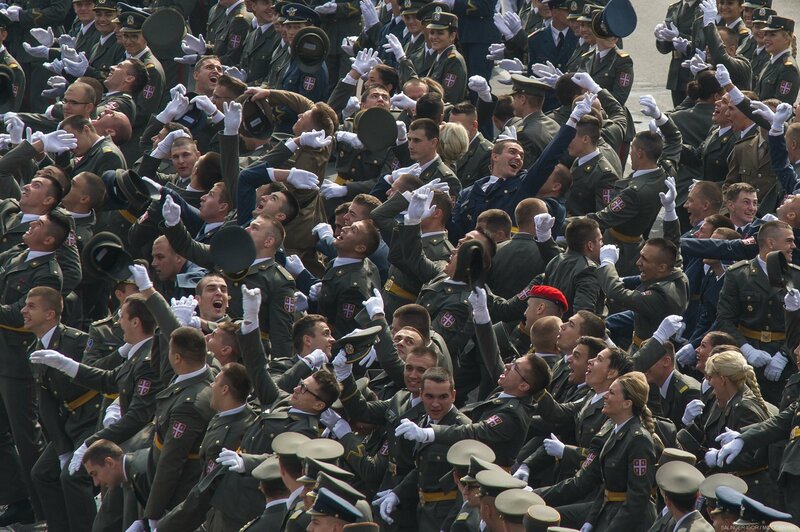 - Dear cadets, you are guardians of the reputation of the Serbian Armed Forces, which has always been a guarantor of the protection of national interests! I believe that you will with dignity, with pride and respect, cherish the memory of the glorious victories of the Serbian soldier, from the further and closer past. To him the Fatherland was the greatest sanctuary, and he was ready to give his lifefor it - Vučić reminded and stressed that it is our sacred duty to never forget and to we always respect it. - The spirit of Kosovo, Karađorđe, Kumanovo and Kajmakčalana will wake up again! Your fate is in your own hands – the president said. The president of the state expressed the belief that the youngest second lieutenants of the Serbian Armed Forces, with much will and enthusiasm, would follow the path of the heroes who paved the ways of glory and heroism for them, and that they would use their personal courage, acquired education and human virtues for the quality and responsible fulfilment of their lifetime calling thus making possible for Serbia to progress in peace in all fields. - The youngest second lieutenants of our armed forces, I am convinced that you are impatient to take decisively the honest way that Serbian officers are going through their life! In that name, I cordially congratulate you on your initial officer’s rank, and I wish you to be a strong dependence of our homeland and our citizens! We believe in you! Serbia believes in you! Long live the Serbian Armed Forces! Long live Serbia – exclaimed the supreme commander at the end of his address to the ceremonial line of young officers. The youngest cadets and all those present at the ceremony were addressed by Colonel Miroslav Talijan, Commandant of the Military Academy. He emphasized that there is no room for suspicion because our people today, with their inherited military genome, developed in battles and wars for freedom, with the Serbian Armed Forces and its officers, whose corps has been strengthened today by the line of new officers, will successfully respond to all modern security challenges, risks and threats. This class of the Military Academy has achieved a very good results, with an average grade of 8.24, and the class of the MMA Medical Faculty that achieved excellent results with an average grade of 9.54, Colonel Talijan said, pointing out that with all they acquired at the Academy - knowledge, skills and habits, they will contribute to the units in which they will serve, but also to the local communities in which they will live. Colonel Talijan reminded that in the line of the youngest officers of the Serbian Armed Forces there are cadets who are holders of the Epiphany Holly Cross from swimming on Ada Ciganlija, members of the women's futsal team, and holders of the finest medals from domestic and international competitions in karate, kick-box, judo, futsal, military multisport race and pentathlon. Commandant of the Military Academy told the second lieutenants that from now on it depends on them primarily whether they will be excellent, as officers, people, parents, and in many working and life roles they face. - With full confidence in you, with hope and wish that you be happy and faith that God will help you, on behalf of all the participants of this solemn event, I wish you a happy path to the Serbian Armed Forces units and the organisational unit of the Ministry of Defence, said Colonel Talijan, telling them that on the new pages of their lives they are writing deeds to be unforgettable. The first in the ranking of the Military Academy addressed the participants on behalf of the 139th class, Second Lieutenant Maša Ilić, who reminded that the word “officer” means duty to our homeland and service to our people and state, pointing out that the officers are the mainstay of the army, and the army is the mainstay of the people, and that as young people, full of knowledge and energy, they are needed by their own country. - We will try to maintain what we have achieved with the help of the commanders, professors and all others who were involved in the educational process at the academy. We have passed the life school that only exists there, Second Lieutenant Ilić said, urging younger colleagues to believe in themselves, as this is the only way to deal with the many obstacles that stand on the path to success. Greetings to the youngest colleagues were also sent by the pilot Major Aleksandar Beara, from the planes that made today’s ceremony magnificent. - Congratulations to my youngest colleagues on their first rank! Serve your nation honourably and be the pride of your homeland. Long live Serbia! - Major Beara said. The MiG-29 jets that flew over the capital today in honour of the youngest second lieutenants, upon the order and at the initiative of the President of the Republic of Serbia and Supreme Commander Aleksandar Vučić, are named Colonel Milenko Pavlović, Colonel Slobodan Medić and Major Zoran Radosavljević, pilots who gave life for freedom of Serbia. At today's ceremony, the parade of the youngest second lieutenants and cadets of the University of Defence has been performed, along with the overflight of the aircraft of the Serbian Armed Forces. The programme of the ceremony was completed by the performances of the “Stanislav Binički” Artistic Ensemble of the Ministry of Defence and the Representative Orchestra of the Guard, cadets of the Military Academy performed drill, and the drama and cultural-artistic programme. The ceremonial promotion of the second lieutenants was attended by the top-level state and military leadership, representatives of the diplomatic corps, delegations of the armed forces of friendly countries, religious organizations, numerous guests from the country and abroad, families and friends of newly-promoted second lieutenants and citizens. This year, 102 male and female cadets of the 139th class completed the Military Academy, including two cadets from the Armed Forces of Bosnia and Herzegovina and one from the Ministry of Interior of Republika Srpska, along with 29 boys and girls of the 4th class of the MMA Medical Faculty.